What's Happening in Birmingham this April 2018? 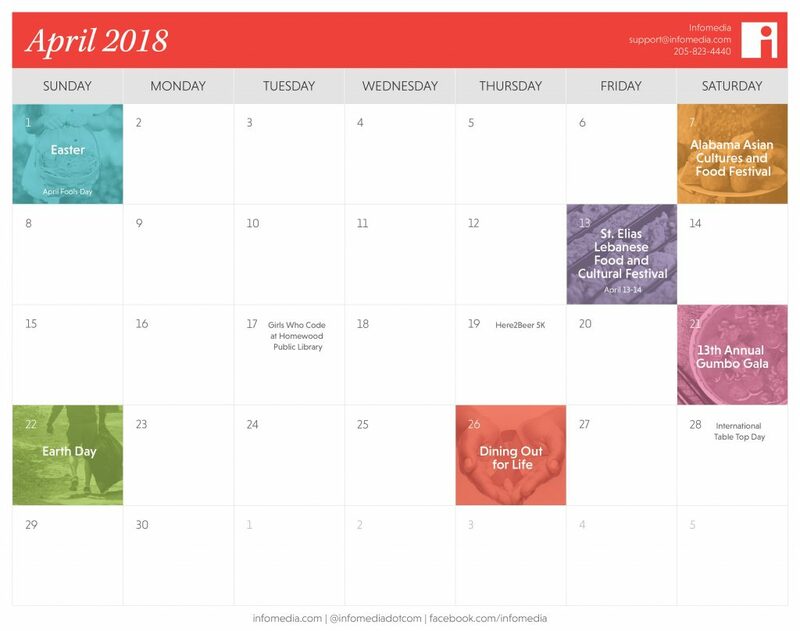 Find out with Our Free Calendar | Infomedia, Inc.
From Easter egg hunts to fun 5ks, Birmingham, AL has a large variety of events taking place in April. Keep up with everything, and get inspiration for your own social media postings, by downloading our free calendar. The ultimate day for hoaxes and pranks, April Fool’s Day is the perfect time for jokesters. It’s a good idea to take everything you read or hear with a grain of salt on this holiday. The Alabama Asian Cultures and Food Festival is a one-day event held at the Zamora Shriners. Hosted by the Alabama Asian Cultures Foundation, the event contains a wealth of international delights to see and taste. Try various foods from local restaurants, admire authentic Asian costumes and watch performers from around the world. A staple of the food festival scene in Birmingham, the St. Elias Lebanese Food and Cultural Festival is celebrating its 20th year. The festival will run all weekend long, serving up thousands of plates of food during that time. Entrance to the event is free, and Lebanese delicacies like rolled grape leaves and falafel will be available for purchase. Also don’t miss out on the Amin Sultan Lebanese Band, silent auction and traditional dancing. Girls Who Code is a national club with the goal of increasing girls’ participation in the STEM fields. Their free class is being held at the Homewood Public Library and will teach girls 4th-grade-and-up about programming basics. While a laptop is suggested, it’s not required. Pairing two popular activities in Birmingham, the Here2Beer 5k highlights both running and breweries. The race starts with participants drinking a cold beer (or root beer) at Good People Brewing Company, running through the heart of downtown Birmingham and the Rotary Trail, and finishing with another beer at Avondale Brewing Company. Held at Sloss Furnaces, the 13th Annual Gumbo Gala is a fundraising event for the Episcopal Place, an organization that offers affordable housing for seniors and those with disabilities. The day will include a gumbo cooking competition, live Cajun bands, kids’ zone and local art displays. This worldwide event is meant to display support for environmental protection. You can celebrate on your own by visiting a local green space, or search for Birmingham events focused on Earth Day. The Birmingham Botanical Gardens and the McWane Center often have free events that are announced mid-April, so keep an eye on their calendars. By simply going out to dinner, you can contribute to fighting disease in Alabama. Benefiting AIDS Alabama, a nonprofit organization dedicated to improving the lives of those diagnosed with HIV/AIDS, Dining Out for Life is an event hosted at multiple Birmingham restaurants. Varying per business, each restaurant has dedicated to give at least 25 percent of their profits to the organization. Some local favorites are participating this year including Rojo, Slice Pizza and Fancy’s on 5th. An all-day event hosted at the Hoover Library, International Tabletop Day is meant to celebrate games of all types. From role-playing games like Dungeons & Dragons to board games like The Settlers of Catan, you’re sure to find a variety of entertaining games to play with enthusiastic people. Want to keep up with events around Birmingham? Download our April 2018 free calendar — feel free to add a few activities of your own!